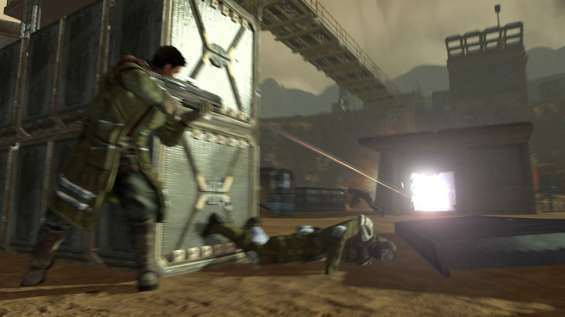 Set 50 years after the climactic events of the original Red Faction, Red Faction: Guerrilla allows players to take the role of an insurgent fighter, named Mason, with the newly re-established Red Faction movement as they battle for liberation from the oppressive Earth Defense Force (EDF). 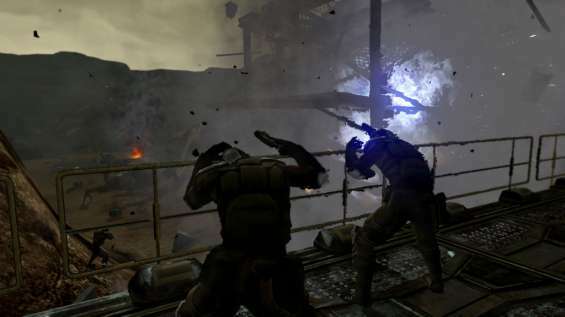 Your mission is to help the Red Faction eradicate the EDF from Mars. 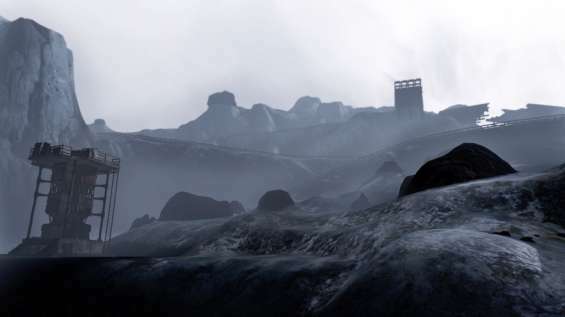 This sequel has moved away from the first-person perspective and uses third-person instead. After booting up the game for the first time, you will have to wait around 5 minutes for game data to install. After a 2 and a half minute cut-scene and some loading you get to control your character. 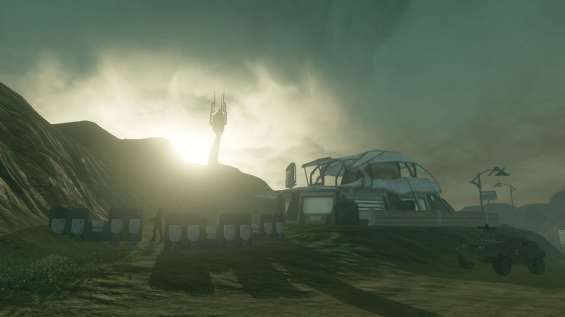 The tutorial mission starts off near an old mining lab on Mars. Your first mission is to destroy a lab using remote charges and your sledgehammer. The mission itself is very simple – you have to place charges on two buildings and blow them up, collecting salvage on the way. Salvage can be traded in for weapon upgrades. Completing the first mission earns you a trophy (Welcoming Committee). After another cut-scene you are back to playing as Mason. You are now free to tackle missions and help out your faction in any order you choose. 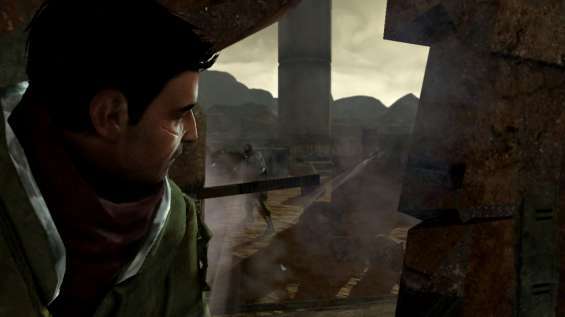 The game uses the open world approach but some missions follow a linear pattern. There are six areas you play through, starting at Parker. In order to clear an area you must complete the missions and destroy any EDF strongholds in the area. Controls are easy to use. R1 is fire and holding R2 brings up the weapon select menu. You can then use the D-Pad to select a weapon. You can only hold 4 weapons at a time. You use the left analogue stick to move and the right one to aim. Pressing and holding L3 causes the player to crouch – you can change this to a toggle through the settings. R3 is used to toggle zoom. There is a whole range of weapons available from a sledgehammer to pistol, assault rifle and rocket launchers. You start off with a sledgehammer, assault rifle and remote charges. Other weapons can be unlocked by collecting salvage or by picking them up from fallen enemies. The start menu lets you check your progress, check mission statistics and save or load games. The statistics also shows you how far away you are from earning a trophy, shown as percentage. For example, completing five guerrilla missions earns you a trophy, but this also counts towards earning two other trophies. For each guerrilla mission you complete, the relevant trophy progress meters are updated. It took us about 10 hours to complete the main part of the game. We did the main missions and some guerrilla missions in this time. In order to complete the game 100% we could easily take 20+ hours. There are 104 guerrilla missions in total and lots of little extras that can be tacked after you finish the main missions. Once you are done with the single-player campaign mode, there are two multiplayer options available: Online/Local multiplayer and Wrecking Crew mode. 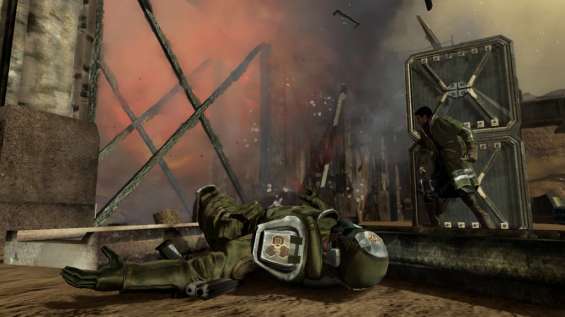 The Wrecking Crew mode was somewhat disappointing – although four players can take part, there was no split-screen gameplay available. Instead, each player takes turns in causing the most destruction as possible and then pass the controller to the next player. There are four wrecking modes available: Barrel Dash, Total Chaos, Rampage and Escalation. In Barrel Dash you have to destroy 5 red barrels in 60 seconds. In Total Chaos: you have 1 minute to do as much damage as possible. Rampage is similar to Total Chaos, but you have 3 minutes to cause as much destruction but you lose time for each remote charge or bullet you use. In Escalation you have to do as much damage as possible with limited ammo. 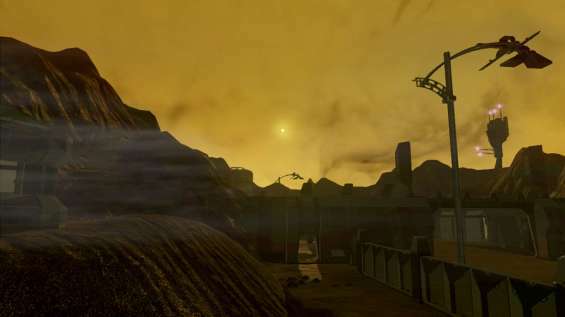 There are four maps available in Wrecking Crew: Fortress, Scrapheap, Transmission and Gulch. The online multiplayer offers a lot more replay value with several game modes available, including co-op missions. The local multiplayer options requires you to have several PS3s connected to the local network, so unless you are at a LAN party, it’s unlikely you will be using this mode. We didn’t get to try out the online multiplayer mode during our play-through as no one was online (since the game wasn’t out yet). The sheer destructibility of the environment is what impressed us most about this game. All the building in the game are destructible to some degree – but it’s not scripted. Using a rocket launcher to damage a building will not always cause the same kind of damage. When the building collapses, the debris left over is completely random. If you ever find yourself in a pickle, bring out your sledgehammer and make a hole in the wall so you can escape. You can use hydrogen tanks, propane tanks and barrels to help you destroy buildings or set traps for enemies. The vehicles in the game handle well and look great too. 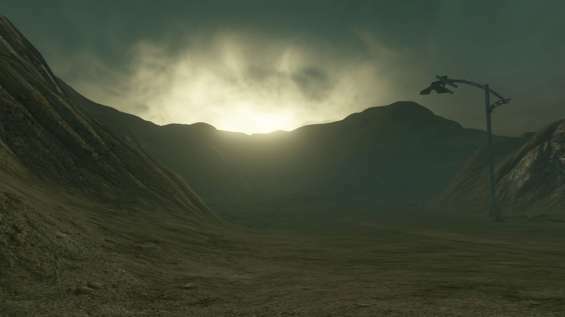 As the game is based on Mars, the vehicles and weapons all have a futuristic feel. There are many vehicles you will come across from off-road vehicles to pickup trucks and even taxies. Our favourite vehicles were those owned by the EDF. 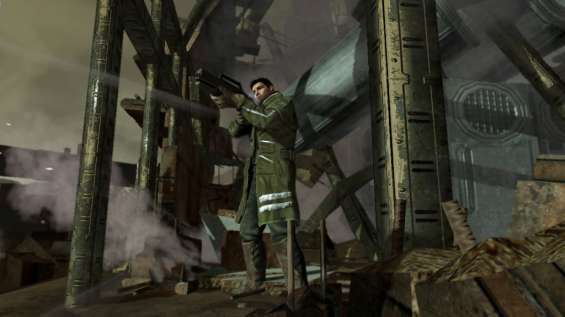 Some of the vehicles you come across have roof-mounted weapons to help you blow up the EDF vehicles or use in missions. The AI is really good too. Guerrilla reinforcements will join you to provide support and they make good use of cover using the environment and vehicles. As for the enemy, the also use cover and work in squads to take you out. There are four difficulty settings to choose from, which can be changed mid-game if you prefer less (or more) of a challenge. The graphics are impressive at 1080p on a HDTV. The environments are detailed when you are near populated areas, but the rest of the environment is plain, though you can see the work going into the environment to make it look life-like. There isn’t much difference between the six different areas of Mars except for slight changes in terrain and color. The character models are decent but there isn’t much detail on the enemies. The game runs at a decent 30fps, though it does slow down considerably when there is lots going on. Multiple explosions, crumbling buildings and multiple characters on the screen all cause the framerate to drop though it’s not damaging to the gameplay in anyway. The effects and physics of the game are realistic and sometimes down right amazing. You can easily find yourself playing for hours totally immersed in the game. Loading times in the game are decent are not very common. While in the game you will rarely come across a loading screen unless you load a saved game or retry a mission. One of the annoying parts of the game is the auto-save feature, which you will see before starting a mission and after completing (or failing) it. This usually takes up 30 seconds of your time. Saving data in the background would have been much better, rather than breaking up the gameplay. 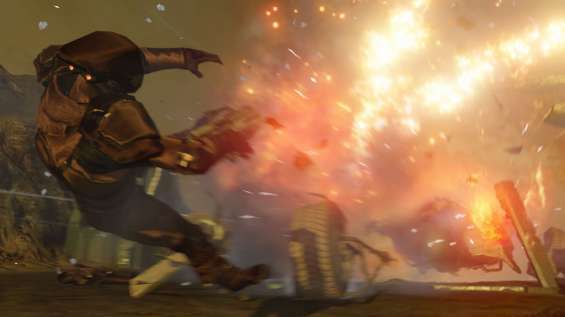 Red Faction: Guerrilla has been a real treat to play. We thoroughly enjoyed the campaign mode and still have lots to do before we complete it 100%. It would have been great to try out the multiplayer mode but at time of review there weren’t enough players online. We found ourselves playing the game for hours on end. The single-player campaign mode is fairly short taking us 10 hours to complete but the extra missions and online multiplayer is sure to keep you busy for many more hours. 51 unlockable trophies is also another reason to spend hours on this game. We recommend purchasing this game or at least giving the playable demo a go. Should be getting my copy today!